“I wish we had something like this in Gatesville, I’d hang out here all the time.” These were the first words I spoke to my wife as we entered the Hotel Indigo in Waco. I like the open air lobby as it has a sense of a “community room” to it. The check-in desk is small and off to the left of the room rather than the standard front and center. Off to the right is an informal sitting area and meeting rooms, in the center is the lounge and restaurant area; very inviting. We took a seat in comfortable chairs at the low bar and were greeted by a wonderful bartender mixing superb drinks. The wine offering is a step up from your typical hotel wine selection offering unique Texas wines and other good choices. We were then greeted by the hotel manager and given the grand tour. I found the “Huaco” meeting room to be ideal for large gatherings with its upgraded audio visual system suitable to simulcast events like TED talks, game viewing and corporate presentations. While the “Judge Waco” meeting room is ideal for smaller board style meetings and presentations. The pool area is very nice for a little rest and relaxation with a portion of the pool indoors for inclement weather, hot tub included. There is also enough patio room to host your poolside reception. Our biggest surprise of the night was the menu and taste of the food. Who would have thought that a cafe sized lounge and restaurant would produce such an exquisite dining experience. 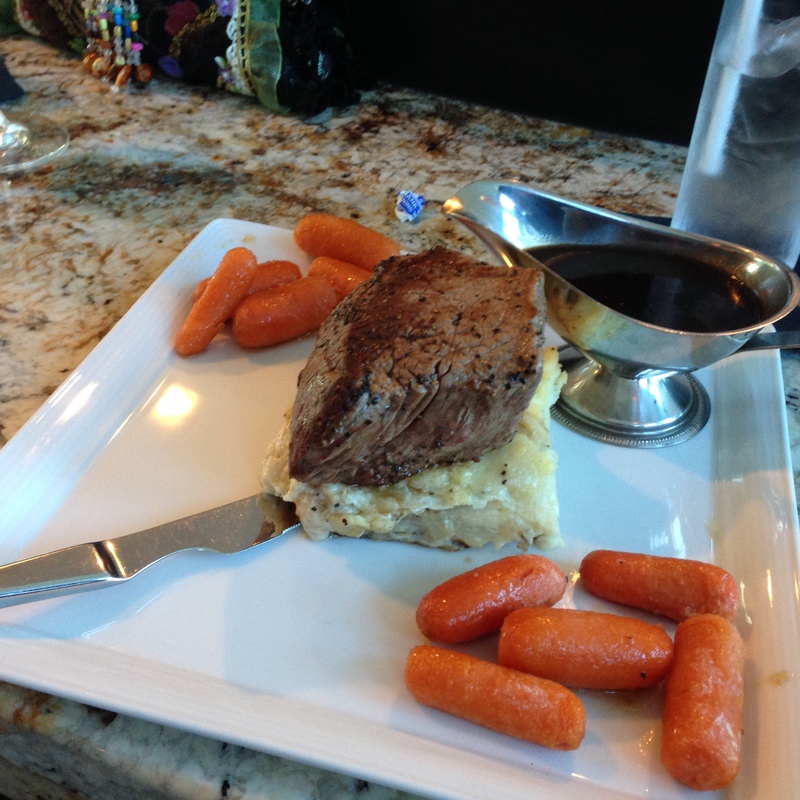 We were served fresh salad, steak and vegetables, then cheese cake and coffee for dessert. It was the best steak I had had in months. 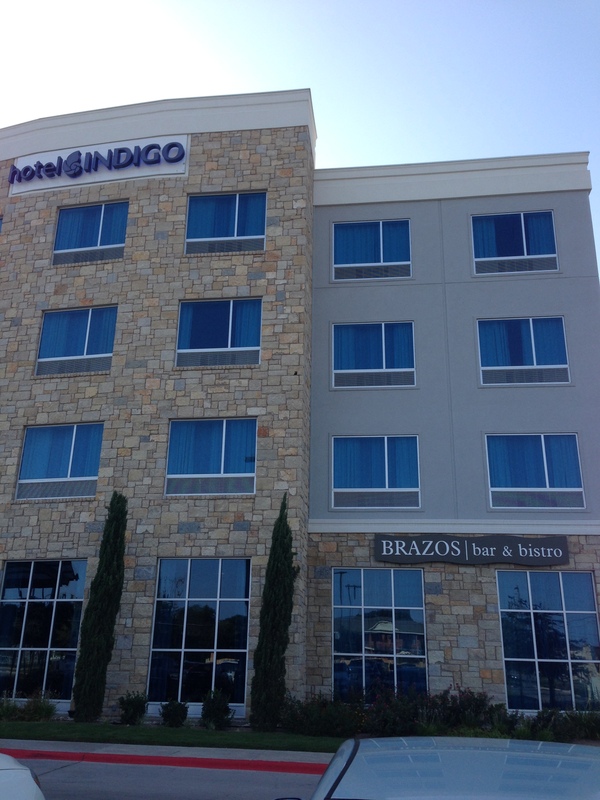 Yes, the facilities at the Hotel Indigo Waco are very well designed and inviting, but what would a grand hotel experience be without a fine staff? From the front desk staff, to our wait staff, to the bartender, we were charmed and received excellent, personal service. This hotel could be in uptown Dallas, on Westheimer in Houston or on 6th Street in Austin and do very well. It’s a touch of elegance and class in the heart of Texas. Disclaimer: Our dinner and drinks were provided by the Hotel Indigo Waco.